It’s only been a few days since I released the small bowl project and I’ve already been getting some great tips and advice from many of you on how to improve my turning. 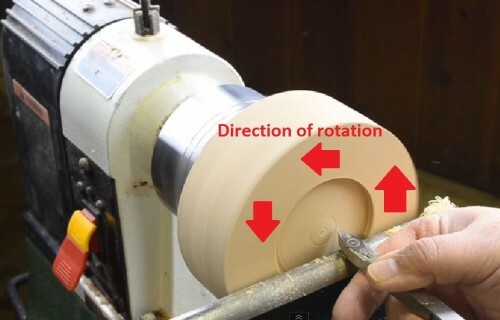 It’s a slippery slope into woodturning! Considering I’m very open about the fact I have a lot to learn yet, I really appreciate them! 1. Tool placement – Of all the comments and suggestions that came in this one is by far the most glaringly obvious one I missed, and thankfully it didn’t come back to haunt me, so I’m pretty lucky! 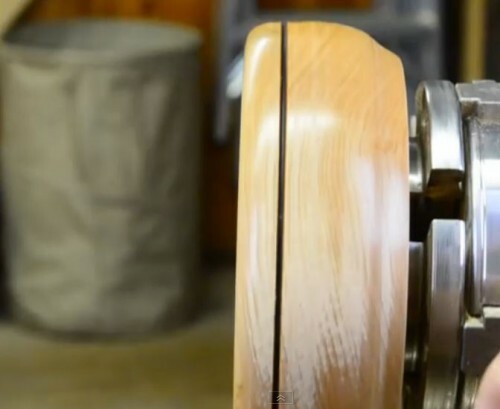 If you didn’t notice it, because like me you’re a little green at turning, but around the 14:30 mark (click on video above to go directly to segment I’m talking about) I placed the detailing tool on the right side of the tool rest. Why is this is a big mistake to avoid? It’s simple really, as the wood is spinning around, pushing the tool into the wood on the right hand side potentially means it could be pulled out of your hands. Facing the blank as I was doing at this point, the correct place for the detailer should have been on the left side where the rotational forces would have held it tight to the rest. Why didn’t it pull out of my hands on the right? You can’t tell, but I was actually pinching it slightly against the tool rest’s lip. It becomes more obvious there was a problem as I was finishing the original detail work and was getting shaky results on the outside. 2. Tools can make a difference – Perhaps the one piece of advice I’ve been hearing quite a bit about is my tool choices. While there’s no arguing the Easy Wood Tools did in fact allow me to quickly and easily make this project (and some others coming up) in some situations they’re not always the best tool for the job. In fact, as I keep hearing from some folks, they act more as a scraper than a cutting tool. Where this seems to have the greatest impact is on end grains. The scraping effect can leave a nice clean, tear-out free surface on much of the project, but there is some noticeable roughness in the end grain. Some end grain shows through. 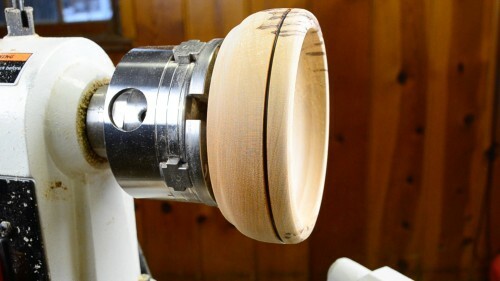 I’m curious to see if it can be tweaked by using a different angle of attack with the Easy Wood Tools, or if I’m really going to need to grab my traditional bowl gouge and try that instead. I will say, I started out with EWT’s smaller tools and they are great for rough shaping. After a lot of going back and forth I finally ponied up for a Sorby 3/8″ bowl gouge and the OneWay grinding jig, I ground the bowl gouge to an approximate Ellsworth grind and haven’t looked back when it comes to finishing cuts. It was a bit of an investment, but that gouge stays in my hands over way more than any other tools. Skews and scrapers would be a close second. It’s worth a shot, I promise! Thanks for the feedback Thomas! Oh, and if its in the budget at some point look into an expanding jaw chuck. I like Nova’s Chuck, but the EWT’s easy jaw chuck looks really tempting as the jaws are way easier to change out. I have the Nova G3 for my midi lathe, and it makes work holding many, many times easier. With all the different jaws you can really expand your possibilities. I have the standard jaws, the 1″ pin jaws and the mini cole jaws and can hold just about anything in any position securely that can fit on my lathe. Don’t you mean on the LEFT side? I’d fire my editor, but it’s me…I’ll just tell myself to stop writing at night just before bed LOL! Great video, Id rather learn from other persons trouble than my own. I don’t have a woodworking lathe but use my metalworking lathe for turning simple stuff like handles and pens. Dane a lidded bowl is something that’s high on my list of “must do soon!” Thanks for watching and writing.